It’s more than a resort, its home! At the Indies Hotel, comfort, ease and peace are the hallmarks of our resort. At our small family-type resort, we bring the concept of a “home away from home back” to life. Our guest rooms, including a selection of 15 single, double and triple room, offer the ideal lodging for relaxation and rejuvenation. All of our rooms are divided into two (2) wings. Relax & enjoy a garden view from your room. 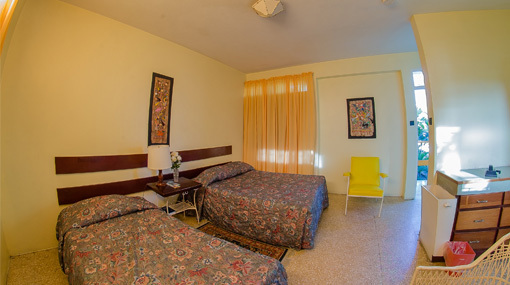 Take advantage of our wide range of amenities in your room, from air conditioners to telephone, cable television, a safe box, private bathrooms with hot and cold water and Wi-Fi. Welcome home! A pleasant stay awaits your arrival! An extremely pleasant stay on budget! Room rates include Government Tax and Service Charge only. We accept all major credit cards including American Express, Master Card and Visa Card. Other methods of payment include cash – US$, CAN.$, STG$, EURO$, JA$ & Multilink. Reservations can be made via email at indieshotel@hotmail.com., telephone or fax. Cancellation Policy – Ten (10) days before your arrival or the first night will be taken from your credit card or your deposit.